The Sigma Delta Tau Outstanding Achievement Award recognizes outstanding leadership and community service. It was first presented in 1938 and was last awarded in 1988. This year, Sigma Delta Tau is proud to announce that Beth Metzger Gruber, Phi-Penn State University (1988), has received this honor. She is only the eighth person to receive this prestigious award. Beth was recently honored for 25 years of service to SDT. She has served on National Council in various roles, as a Chapter Advisor, National Vice President, National President from 2002-2006, and as an Alternate Delegate for the National Panhellenic Conference. During her tenure as National Extension Chairman, SDT colonized nine chapters. For the past two years, Beth served as the Centennial Chairman, responsible for creating the incredible weekend celebration that took place in New York City, June 23-25, 2017. 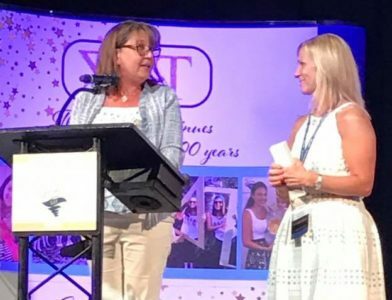 Most notably, during her term as National President, Beth was responsible for fostering the partnership between SDT and Jewish Women International. Beth received her recognition to a standing ovation during the Centennial Celebration, on Sunday, June 25, 2017, at the Hard Rock Cafe during the Sisterhood Brunch program.